Ingesting protein during training can minimize muscle breakdown from training. Protein should be ingested in smaller quantities (10-20g) than carbohydrate (up to 80g) because they are digested slower. Consume this amount of protein and carbohydrate with large amounts of liquid (1L/32oz) to prevent a hypertonic training drink that can lead to dehydration and an upset stomach. As an athlete exercises, skeletal muscle is broken down, this is known as catabolism. Conversely, when protein is ingested, skeletal muscle is synthesized, or grown. This is known as anabolism. The catabolic/anabolic balance, or the balance between break down, and growth, determine long-term muscle gains or losses. In essence, you never have exactly the same amount of skeletal muscle, because it is always breaking down or growing in small amounts. This is an essential scientific principle to understand. 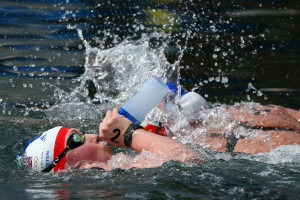 For athletes, and swimmers are no exception, increased amounts of dietary protein are essential. I want to dispel a myth right now; PROTEIN IS NOT JUST FOR BULKING UP! 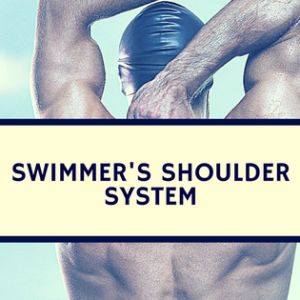 Swimmers also have an increased need for protein… Trust me! Muscle soreness is a result of muscle breakdown. 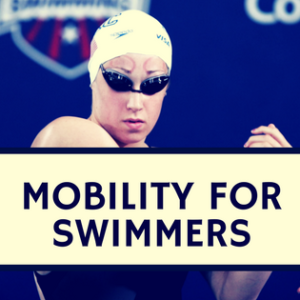 Even if a swimmer is doing primarily aerobic-type training, skeletal muscle is still being broken down, and needs to be repaired if the swimmer wants to stay strong and healthy day after day. 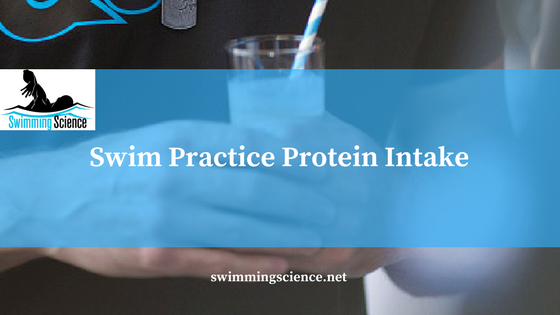 So if you accept the premise that swimmers have an increased need for protein over a sedentary individual to balance off the increased muscle break down from training, then the idea of consuming protein (anabolic) while training (catabolic) actually seems quite logical. It’s not that simple though; the body can only absorb so much protein at one time, especially during rigorous training. 1-2% protein solution is ideal (i.e. 10-20g of whey protein in a 1L (32oz) bottle). This can be combined with a carbohydrate solution as well (carbohydrate intake during training can delay the onset of fatigue). The key is the size of the bottle, as 20g of whey in a 500ml (16oz) bottle, is actually a 4% protein solution. This could be hypertonic. Soft drinks are a great example of a hypertonic carbohydrate solution. Too much carbohydrate and not enough water leads to the soft drink being hypertonic. This can dehydrate an athlete, which is why we don’t drink soft drinks during training. Again, using a 1L (32oz) bottle ensures the ratio of protein and carbohydrate to water is simple to establish (10g = 1%) and consistent throughout training, even if athletes don’t get through the whole bottle [see if chocolate milk fits these requirements]. By Kevin Iwasa-Madge BASc, CISSN owner of iMadgen Nutrition, and as a former top-5 finisher in the world as a freestyle wrestler, Kevin embodies the lifestyle of an elite athlete. Kevin completed his undergraduate degree at the University of Guelph in the Applied Human Nutrition. This clinically focused program allowed him the opportunity to address a range of diseases from a nutritional approach. After graduation, Kevin attained his certification in sports nutrition from the International Society of Sports Nutrition. Athletically, Kevin has been an elite wrestler for over 10 years, competing for both the University of Guelph and Team Canada. Kevin is a former First Team All-Canadian, Academic All-Canadian, and Canadian Champion. As a varsity athlete, Kevin was short-listed for the prestigious Student-Athlete of the Year award. He currently trains with and competes for the Guelph Wrestling Club and National Team. Over the years, Kevin has worked with a range of individuals, from those looking to improve their overall health, to rugby player, football players, swimmers, professional fighters, wrestlers, endurance athletes and more. Great advice from a person well qualified to give it! Good to know. 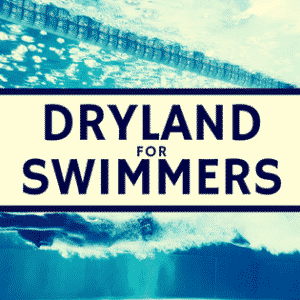 My son is 14 and in a high performance swim program. This is helpful info.